Montreal Mayor Gérald Tremblay is urging people to "take back their city" after a series of smoke bombs paralyzed the public Metro system Thursday morning, sending the island's transit service into chaos at the peak of rush hour. "No cause, legitimate or not, can justify any criminal action that jeopardizes public security," a livid-looking Tremblay told reporters at a news conference later in the day. Although the attacks haven't been directly linked to student protests, Tremblay also urged students and politicians to get back to the negotiating table to settle their tuition dispute, and restore civil order. Police released images of three women suspected in the smoke bomb attacks. Tremblay also defended the city's handling of student protests, and escalating Metro outages. "We've put in place whatever we had to do. Do you want me to take 4,600 policemen and women and put them in the subway? You want me to close the subway? "What do you want me to do? Are we going to stop living because we have a crisis on our hands? No. What's the solution? That's the question." 7:45 a.m. smoke bomb detonated at the Lionel-Groulx station. 8:04 a.m. smoke bomb thrown at the Jean-Talon station. 8:20 a.m. smoke bomb thrown at the Préfontaine station. Secondary smoke was also reported at the Fabre and Pie IX stations. Affected stations were evacuated, and thousands of riders were left stranded outside subway entrances as police, sniffer dogs and firefighters streamed into the transit service points. The disruption left commuters scrambling to board buses and flag down taxis under steady drizzle. Extra buses dispatched to highly travelled routes were overwhelmed as people queued around blocks, waiting for a ride. Significant traffic jams were reported across the city's core, and the Metro system was still jam-packed more than three hours after it reopened. Authorities say train service was completely restored at 10:45 a.m. after what transit authorities conceded was a "total shutdown of the Metro network," according to spokeswoman Isabelle Tremblay. Hours after the Metro shutdown, Montreal police released images and descriptions of four suspects in the co-ordinated smoke bomb attacks. 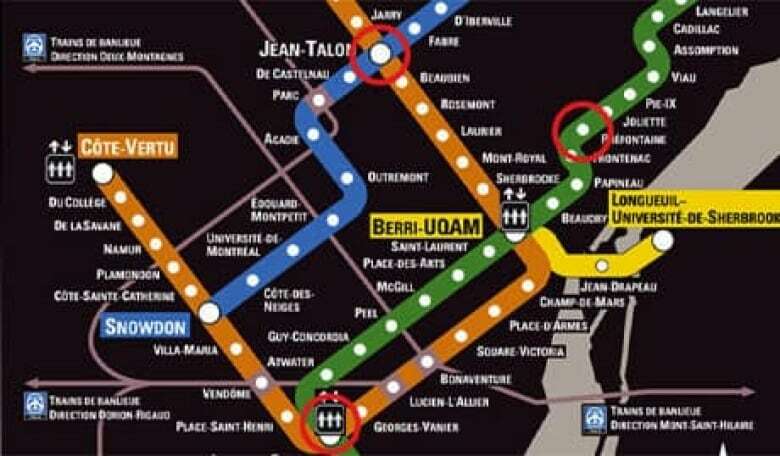 YOUR VOTE: Is there is enough security in Montreal's Metro system? 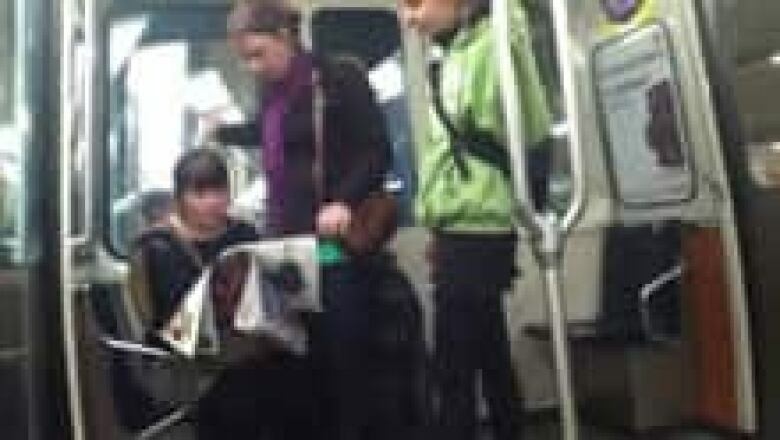 The photos, which police say were taken by citizens and witnesses, include shots of three young women riding together on the Metro as well as shots of one young man. All four suspects are described as around 25 years old. No one immediately stepped forward to claim responsibility for the smoke bombs, though some Montrealers started lashing out at student protesters on Twitter soon after Montreal's Metro system shut down at around 8 a.m.
At the start of the demonstrations in February, protesters who wanted to travel en masse as part of mobile demonstrations used the Metro system, causing minor disruptions. More recently, the Metro has been the target of acts of vandalism. Officials aren't linking the student demonstrations to the actions in the Metro, however the major disruptions started as the tuition protests ramped up. On April 16, someone pulled emergency brakes at five different stations, shutting down the system temporarily. At about the same time, bags of bricks were thrown on the Metro tracks of three lines. The incident is the third smoke bombing in the Metro system in recent weeks. On April 18, someone set off a suspected smoke bomb on the green line, in the tunnel between Beaudry and Papineau stations. No one was injured but the incident disrupted service at the height of the morning rush hour. Education Minister Line Beauchamp said it may be the work of someone taking advantage of the tuition dispute between students and the province. She said it appears that small groups, not necessarily students, are using the situation to create this climate in Quebec. It doesn't help settle the situation with the students, Beauchamp said. Two members of the Liberal government quickly expressed concern over Thursday's Metro attacks. Transportation Minister Pierre Moreau said such acts are completely inappropriate. Moreau and Public Security Minister Robert Dutil are both acknowledging the incident suggests the Metro may be too vulnerable. They say additional security measures to prevent other incidents may be necessary. Opposition parties put aside planned motions on the tuition dispute to present a joint statement condemning the events in the Metro. Québec Solidaire MNA Amir Khadir said he can't find words to describe the morning events in Montreal. He said it stains the cause of those who protest peacefully. "We're looking at evidence and trying to find some clues which will bring us to the people who did this this morning and try to establish what exactly is the motive and circumstances," said Const. Simon Delorme of the Montreal police. "There's a lot of things to verify and this is why our investigation is ongoing."